Adhesives are sticky substances made from a compound that adheres or bonds two items together. Adhesives come from either natural or synthetic sources. Some modern adhesives are extremely strong, and have become popular and successful tools in the creation of art. Whether adhesives are being used to mount a photograph, mask portions of a painting, build a scale model, or even repair a broken sculpture, artists rely every day on sticky supplies to realize their creative visions. Unfortunately, there's no single perfect adhesive for every project. Knowing what materials you're working with, which kind of bond you'd like to form, and how quickly you need the adhesive to dry will help you select the right adhesive or fastener for any work of art. MisterArt.com has a large selection of adhesives online and we'll ship them anywhere in the U.S.! Remember, though, that some adhesives are toxic and require some care while they're in use. Always read any instructions and warning labels related to your chosen adhesives and use them in well-ventilated areas. How Do I Choose the Right Adhesive? STEP 1: Consider the work surface. Is it porous or smooth? Wood, drywall, paper, and cloth are porous; glass, metal, ceramics, and plastic are not. Superglue and white glue adhere to smooth, nonporous surfaces; hot glue and carpenter's (wood) glue are better for porous surfaces. Contact cement is suitable for both porous and nonporous work surfaces. STEP 2: Decide how quickly you want the adhesive to dry. Superglue bonds instantly, hot glue is quick, water-based contact cement sticks immediately and is dry within 30 minutes, white and carpenter's (wood) glues take a few hours, and silicone sealant requires about 24 hours to cure. Epoxies (heat-solidifying resins) vary. STEP 3: Determine whether the adhesive needs to be water and/or heat resistant. Two-part epoxy, superglue, water-based contact cement and silicone sealant are resistant to both. Hot glue doesn't hold up well under extreme heat, but is waterproof. Carpenter's glue holds up under moisture and heat, whereas white glue doesn't fare well when exposed to either. STEP 4: Think about cleanup. Silicone sealant, superglue, and two-part epoxy are cleaned up with acetone-- which is flammable and toxic. Water-based contact cement, new water-based silicone sealers, carpenter's glues, and white glues clean up with water. Once you've determined the ideal qualities of the adhesive you'd like to use, it's time to take a look at the options available to you! MisterArt.com can help. Not only do we offer fast shipping all over the country, but we guarantee the lowest prices on adhesives you'll find online. If you find a lower price on an adhesive on the Web, we'll gladly match it! Due to their sticky nature, adhesives can sometimes be tricky art supplies to work with. Adhesive tape, especially, has a frustrating tendency to tangle, fold in on itself, and cling to hair and skin. Adhesive dispensers are tools designed to make the application of adhesives such as tape a bit easier. MisterArt.com offers everyday discounts on dispensers for all kinds of tapes, from heavy-duty tape dispensers to dispensers built to hold two rolls of different tape. We've even got pens that dispense tape! These adhesive dispensers allow artists to quit fumbling to find the tape's end and simply peel off an appropriate-sized piece of tape with one hand. We've also got dispensers designed to stamp, roll, and run permanent liquid adhesives onto paper, canvas, wood, and more. 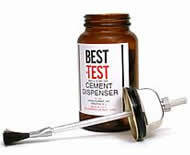 A rubber cement dispenser can even eliminate sticky cleanup of one of the least-viscous art supplies on the planet! As useful as adhesives are, not every art project is intended to be permanent! Sometimes the bonds created by adhesives must be weakened or removed altogether in order to repair, replace, or remove a piece of art. Different adhesive removers are effective on different kinds of adhesives, so it's important to take a look at what sort of bond you'll be using it on before ordering. Some adhesive removers are designed to neutralize the sticky bonds beneath the surfaces of paper adhesives like stamps, stickers, tape, and labels. Other, harsher removers are great for cleaning up and removing excess rubber cement or the sticky overspray from a bottle of aerosol adhesive. Other adhesive removers don't contain any chemicals at all—a simple slab of rubber works wonderfully at picking up dried rubber cement! No matter what sort of remover fits the adhesive you're working with, chances are you'll find it discounted at MisterArt.com! Adhesive sheets, strips, and dots are useful tools that can turn nearly any work of art into a sticker, poster, or magnet. Some of these adhesive products have backing that artists can paint, draw, and mark upon. Others have a backing film designed to be removed in order to attach the adhesive to the back of an artwork. Adhesive paper strips, sheets, and dots are best used to attach art to surfaces on a temporary basis. Typically, the bonds they create are not strong enough to be permanent. Magnetic adhesive strips and sheets can be used to turn works of art completed on paper into decorative refrigerator magnets. They're great for business cards and kids' art! MisterArt.com has fast shipping all over the U.S. on adhesive sheets, strips, and dots as well as all kinds of other affordable art supplies! Glue typically refers to liquid adhesives, but adhesives in other forms such as sprays and solids are sometimes known as glues, also. Because glue has such a broad definition, there are many different kinds of glues intended for many different uses. When determining which glue is best for your project, it's important to consider the art materials you'll be using. Cement is a kind of glue designed to form strong, permanent bonds, often on non-porous materials. Cement is often used on crafts and hobbies. Children's Glue is glue that is non-toxic and therefore safer for use by young children. Children's glue seldom creates strong, permanent bonds, but is very useful for paper crafts and school projects. Craft and Household Glue is noted for its versatility. These glues are great for a variety of art maintenance projects as well as art embellishment. Epoxy and Extra Strength Glue is used to create the strongest, most permanent bonds possible with glue. Fabric Glue is glue specially formulated to create strong, permanent bonds on fabric. 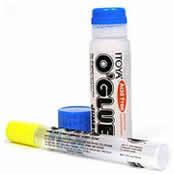 Glue Guns dispense quick, versatile gobs and lines of glue that can be used on a great number of different surfaces. Glue Sticks are an easy way to quickly apply glue over a large or precise area. Great for use with paper crafts and glitter! Paste is an all-purpose, chunky, water-based glue. Wood Glue is glue designed specifically to create the strongest bonds possible on wood. Members of MisterArt.com's VIP Savings Club receive discounts up to 75 percent and more on glue, adhesives, and everything else we offer! Hook and loop is the generic term applied to fasteners and adhesives similar to the well-known, trademarked brand Velcro. Hook and loop adhesives consist of two layers: a "hook" side, which is a piece of fabric covered with tiny plastic hooks, and a "loop" side, which is covered with even smaller and fluffier plastic loops. When the two sides are pressed together, the hooks catch in the loops and hold the pieces together. When the layers are separated, the strips make a characteristic ripping sound. Because it is easy to use, maintenance free, and totally safe, hook-and-loop fasteners have been used for just about every conceivable application where a temporary bond is required. Art, naturally, is no exception! The strength of a hook and loop bond depends on how much surface area is in contact with the hooks, so the more Velcro brand fasteners you apply to your art, the stronger the hooks and loops will hold! Whether your project demands tiny strips or heavy-duty sheets of Velcro brand fasteners, you'll find the deepest discounts on the Web at MisterArt.com! From the refrigerator door to the strips on our credit cards to the very computers used to process the savings here at MisterArt.com, magnets are everywhere! While their incredible uses in electronics have influenced art (and the sale of art supplies!) in ways that the old masters never dreamed of, magnets can still be put to creative use in less complex ways. With adhesive-backed magnetic sheets and strips, you can turn anything from a watercolor to a love note into décor! If simply attaching small magnets to the back of your artwork isn't good enough, try magnetic tape. This substance bonds permanently to lightweight materials to create instant magnets out of paper, plastic, metal, wood, glass, ceramics, fabric, and foam. Or, if creating permanent magnets doesn't suit your art project's needs, slip your photos or drawings into magnetic pockets and sleeves to create snappy, removable refrigerator decorations! You can buy magnets of all sizes and shapes online every day at MisterArt.com! Mounting adhesives are sticky substances designed to affix artwork, photos, and prints onto mounting board as part of the process of framing. Because there are all sorts of art materials that require mounting, there are many different kinds of mounting adhesives devised to do the job. In order to choose the most appropriate adhesive for your mounting project, it's a good idea to take a look at what is being mounted and where the job is being performed. Dry mounting supplies allow artists to mount their work without using a bunch of messy glues, pastes, or cements. These mounting materials often come in rolls of film or sheeting. Simply place or roll the double-sided adhesive onto the mounting surface and then affix your artwork to its other side. Self-adhesive mounting boards cut out the middle man! These are ideal for mounting posters, inexpensive prints, photographs, and other art and craft projects. Mounting sprays are permanent adhesives that deliver a non-damaging sticky coating onto mat boards. Stored in aerosol cans, these adhesives dry clear on metal foil, plastic films, foam, felt, cork, cardboard, fiberglass, and rubber. Adhesive tabs, sheets, and squares are best for smaller projects. Scrappers love the versatility and ease of use these self-stick products feature. Use as few or as many tabs, sheets, and squares as you need to mount photos, articles, drawings, and more. Mounting tapes are double-stick tapes that make mounting artwork a snap. Made in both lightweight form and stronger heavy-duty sizes, there's a mounting tape for any job. Due to our discount pricing structure, MisterArt.com can offer the best deals on the Web for each kind of mounting adhesive! Spray adhesives are adhesives that are delivered using an aerosol can. These adhesives are versatile because they can be applied evenly onto almost any surface or shape. Further serving myriad purposes, these sprays are also available in a wide range of strengths, from tacky, repositionable adhesives to extra-strength, permanent adhesives. Spray adhesives are extremely popular mounting supplies. Because they can be applied to a variety of surfaces, they're a great way to mount different kinds of artwork uniformly. More powerful sprays can bond plastic sheeting, metal foils, fiberglass, and other non-porous materials. Less-tacky aerosol adhesives are great for artwork that may need to be repositioned or removed from the position in which they were originally mounted. Because the fumes of some spray adhesives can be harmful, it's always a good plan to use them in a well-ventilated area while wearing a protective mask. MisterArt.com offers deep discounts on toxic and non-toxic spray adhesives alike. Is there anything that tape can't do? This popular adhesive is so versatile that it's been adapted to suit almost every sticky situation. Take a look at the materials used to complete your artwork in order to find the kind of tape that will work the best on your project! Archival and Book Tape is designed to bind and protect books without damaging the paper materials it sticks to. Artist's Tape maintains a flat surface, is ink and pencil receptive, and is easily removable from paper and illustration board surfaces. Double Coated Tape is sticky on both sides. It's great for bonding two different surfaces together invisibly. Drafting Tape typically peels off cleanly after attaching drawings, blueprints, tracings, and overlays to drawing boards and papers without damage to either surface. Foam Tape is strong and sticky enough to bond and mount even heavier, non-porous art materials. Framer's Tape is an archival-quality adhesive developed expressly for pH neutral mounting, matting, and heavy frame work. Gummed Tape is typically made with linen, a material strong enough to bond and reinforce books, canvas, and other heavier art supplies. Masking Tape is designed to temporarily bond to most painted surfaces, such as walls, painted or finished trim and woodwork, glass, and metal. Packing and Repair Tape was created to be strong enough to bond and reinforce rugged art supplies, including cardboard boxes and packaging materials. Transparent Tape is intended to bond art materials invisibly. No matter what properties you demand from your art tape, you'll find the best prices online at MisterArt.com! Wax is a natural, non-toxic adhesive that forms useful, temporary bonds on nearly any surface. Apply wax cold or melted and it will hold, or peel it off and reposition artwork anytime! Wax stays tacky and dries out slowly, if at all. Museum wax is a great adhesive used to keep artwork displayed on shelves and pedestals in place. Careful application can help ensure that pictures on the wall won't go crooked, too! With a little wax, artists can eliminate the problem of slipperiness entirely. MisterArt.com offers ultra-fast shipping on waxes to destinations all over the U.S.! I am very pleased with the items that I have purchased through MisterArt -- especially since I can't find some of them elsewhere. Also, I received a quick credit for an item that was out of stock. Love the integrity of the company and their service. For clean arches and patterns.